“The serpent was more crafty than any other creature.” Reading this, we can safely assume something is going to happen, and it won’t be good. The devil is out to destroy that which God created, and he is going to start by raising doubts concerning God’s Word for Adam and Eve. 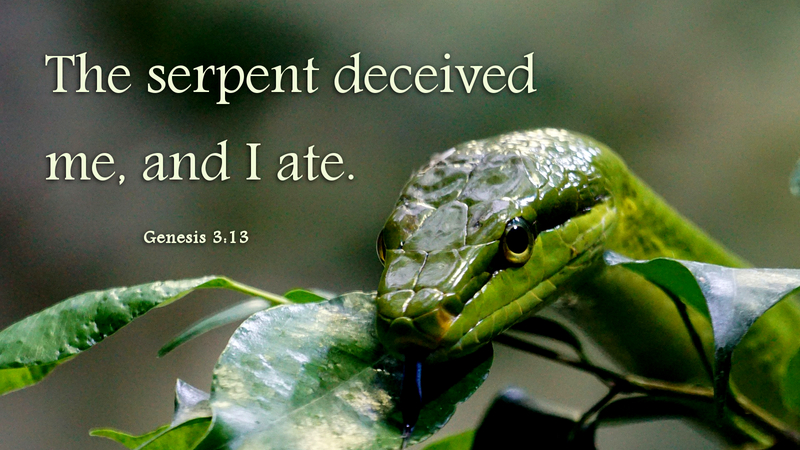 “Did God actually say you shall not eat of any tree in the garden?” It’s a simple question, but it got Eve’s attention. Satan manipulates people, tricking them by misusing scripture and raising doubt. When that doesn’t work, the devil whittles away at our faith by appealing to our “desires of the flesh.” We all face temptation, and all too often we choose evil over good. Thankfully, we have hope in Christ. When Jesus faced temptation in the wilderness he was famished, weak and alone. Satan saw this as his opportunity. His scheme? It was the same trick he used against Adam and Eve, misuse scripture to create doubt. Yet in each instance, Jesus stood on the authority of God’s word. In this, Christ is our example. He is our strength. He is our hope. And when we fail to resist temptation, he forgives freely and completely. Prayer: Strengthen me, O God, that I may be true to your word. Amen. This entry was posted in Forgiveness, Lent and tagged Adam and Eve, Christian, Christianity, Faith, Forgiveness, Garden of Eden, Grace, Holy Scripture, Jesus Christ, Salvation, Spirituality, Temptation. Bookmark the permalink.